Greenaus Solar: FAQ | Guide Before Installing a Solar System | Things You must know before going Solar System. You should always choose a reputable solar module manufacturer with a solid warranty to ensure you will never be left with a solar system that doesn’t perform. Our solar professionals can help guide you through this process to make it easier to understand. Why solar energy in Australia and SA? Australia's energy resources, including solar energy resources, and the factors impacting on the development and adoption of the various energy resources to 2030 are outlined in the Australian Energy Resource Assessment. Australia receives an average of 58 million PJ of solar radiation per year, approximately 10 000 times larger than its total energy consumption. However, Australia's current use of solar energy is low with solar energy accounting for only about 0.1 per cent of Australia's total primary energy consumption. The most common use of solar energy is solar thermal water heating. Solar PV systems play an important role in off-grid electricity generation in remote areas. Electricity generation is increasing in response to government policies, notably the Renewable Energy Target, and as a consequence of the development of photovoltaic and concentrating solar thermal technologies through substantial research and development programs. These include the government's Clean Energy Initiative Solar Flagships Program managed by the Department of Resources Energy and Tourism which has committed $1.5 billion to support the construction and demonstration of up to four large-scale solar power plants in Australia, using solar thermal and PV technologies. The Government's aim is to establish up to 1000 megawatts (MW) of solar power generation capacity. Geoscience Australia is contributing to this program by providing pre-competitive solar resource prospectivity data and analysis to assist the solar industry and research community. The first steps in this project were to improve the collection of solar insolation data through a collaboration project with the Bureau of Meteorology, to increase their solar monitoring ground station network, and to improve the satellite models base used in collaboration with those ground stations. For people interested in solar ground station sites across Australia, you can view a map and information on some of the active solar ground stations currently collecting insolation data across Australia. Living in SA, why should you use solar energy? what is the SA's daily/monthly/annual average sunshine hours? According to the Australian Government Bureau of Meteorology, in the past 15 years, the daily sunshine hour in Adelaide is 8 hours. So monthly 231 hours, and annually 2774 hours. 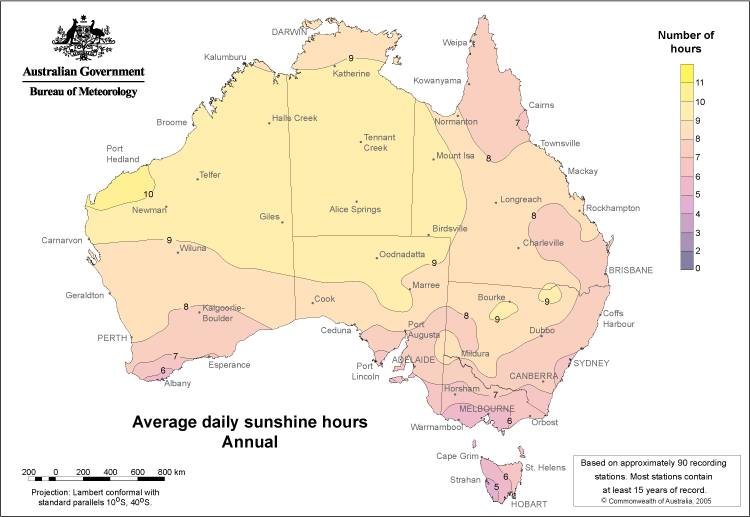 For Solar, South Australia has an average of 4.5 hours of Sunshine over 12 months. More in Summer time and less in Winter time. How solar energy can be transformed to electricity? How much does it cost to have install a Solar System? The price of solar systems has dropped dramatically over the past few years, making it an increasingly attractive option for homes and businesses. 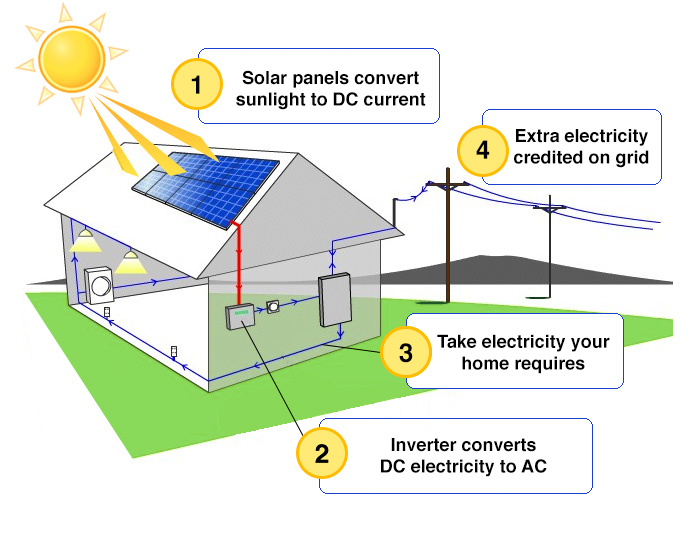 The upfront cost of your Solar PV system depends on how much Government incentives are available at the time of purchase, the type and number of solar panels to be used, the type of inverter to be used and if you are chossing a normal grid connect system or battery backup system. How much money will I save on my solar system purchase? - The energy consumption of your household. Solar panels can only generate electricity while the sun is shining so the households that use a lot of power during the day may attract greater savings than those households that consume most of their power at night. However, you will still receive a feed-in tariff for any excess electricity you generate during the day and export back to the electricity grid. - The size of your proposed Solar system. The bigger the system the more likely you are to save more money depending on your daily usage. We have built a Power Bill Saving Calculator for our customers to get a roughly result base on their scenarios. What is a Solar Feed-in-Tariff (FIT)? A feed-in-tariff is the amount the electricity retailer pays you for any electricity your solar PV system generates that you don’t use, and is exported back to the electricity grid into the grid. Feed-in tariffs will be different in every state and by every electricity retailer. STCs are a government incentives that help reduce the upfront cost of installing your solar PV system. The value of STCs for your solar system that you receive depends on the size of the system and location of the installation. To be eligible for the STC's, your solar system must be installed by an accredited Clean Energy Council (CEC). installer. Do I have to change my existing Electricity Meter? It really depends how old your current electricity meter is at your premises. Some Meters installed are ready to be connected to Solar whereas older models will have to be changed to a Smart Meter to be able to read how much solar electricity is being exported. If your meter requires changing Greenaus Solar will do all the paperwork for the changeover. It is then up to the Electricity retailer to change the meter for you. How much rebate can I get from the government by installing a PV System? The government rebate for PV Systems depends on the size of PV System you choose, The bigger the system the more rebate will be allocated to you. You can check the government rebate here by providing us with few details. What Solar panels should you choose? A lot of people get confused about the Tier system and believe the tier rating is based on the solar modules but this is incorrect. Tier one includes the top 2 percent of solar PV (photovoltaic) panel manufacturers. 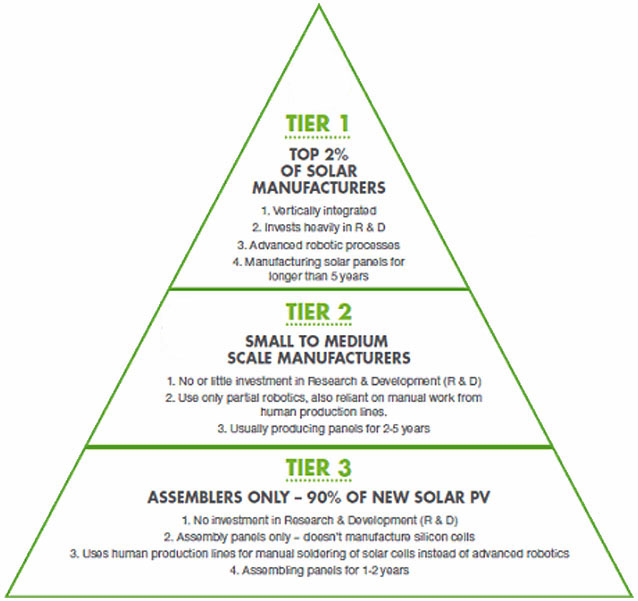 A Tier 1 rating is actually based on the Solar Module manufacturer not on the individual modules. To be a Tier 1 company they have to Vertically Integrated, Invest heavily in R & D, have an advanced robotic manufacturing process, have manufactured over 5 years and have bankability which means some of the worlds largest finance providers have financed large projects around the world. What about the Solar Panel Warranties? Most Solar Panel manufacturers have a minimum of 10 year Product warranty and come with a 25 year Linear Efficiency warranty. At Greenaus Solar the chosen Solar Module being Suntech has a 12 year Product warranty which is covered by Suntech-power. What inverter do I choose? There are many Inverters in the Australian Market and it really depends on what size system you choose. All Inverters used by Greenaus Solar are on the approved Inverters list issued by the Clean Energy Council and carry a minimum 5 years warranty which can also be extended to 10 years. All inverters used by Greenaus Solar have an Australian service centre to ensure quick warranty repairs or changeovers. How much panel capacity do I need? Nowadays you don't make much money from feeding electricity back into the grid. So you need to maximise your own use of your solar PV and minimise your export into the grid. The panel capacity depends on your roof space and your current electricity usage. At Greenaus Solar, we will design a system that will suit your needs. You can check how much benefit you can earn by install a PV system by our Power Bill Saving Calculator. Should I choose off-grid Solar system or on-grid Solar System? Currently, there is no government rebates on battery storage, and the cost outways the return of your investments. If you are a customer who has off-grid Solar power needs, such as on-site energy supply, rural area and cannot connect to the grid for other reasons, the answer is "yes". However, if you are looking for the maximum benefit of installing a PV system, the answer is probably "No". Greenaus Solar is a South Australian based Solar company that prides itself on their service and commitment to the solar industry. We provide top quality services and products with affordable prices. Are Solar Systems from Greenaus Solar high quality? All panels we provide are premium, high efficiency panels. We recommend Suntech, a producer of top quality solar panels with a 12 year product warranty. We also can provide all the top brand inverters you can find on the Australian market. Still have questions? Contact us for a free consulting service.